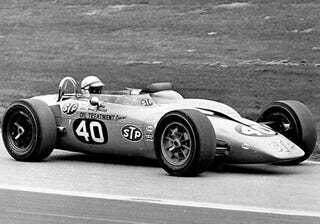 In 1967 Parnelli Jones lead the Indianapolis 500 in an all-wheel drive entry built by Andy Granatelli - and powered by a jet turbine. With Jones at the wheel the turbine car almost won, but was felled by a spent bearing with but a few laps left in the race. "Silent Sam" was nonetheless a crowd favorite. Parnelli's son PJ Jones and crew plan to honor the 40th Anniversary of this tremendous feat of motorsports achievement and engineering innovation with a florescent orange livery and number 40 in-a-meatball on their entry at this, the 91st running of the Indianapolis 500. Team owner Kent Baker said that "We hope to recapture some of that excitement and recognition without the STP pajamas." We're hoping for more turbine cars and STP Pajamas.